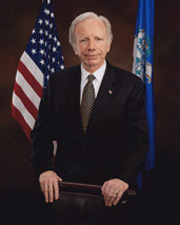 a Senator from Connecticut; born in Stamford, Fairfield County, Ct., February 24, 1942; attended Stamford public schools; graduated from Yale University 1964; received law degree from Yale Law School 1967; member of Connecticut state senate 1970-1980, majority leader 1974-1980; attorney general of Connecticut 1983, 1986-1988; author; elected as a Democrat to the United States Senate in 1988; reelected as a Democrat in 1994 and 2000; reelected as an Independent Democrat in 2006, and served from January 3, 1989, to January 3, 2013; chair, Committee on Governmental Affairs (One Hundred Seventh Congress [January 3-20, 2001; June 6, 2001-January 3, 2003]), Committee on Homeland Security and Governmental Affairs (One Hundred Tenth to One Hundred Twelfth Congresses); unsuccessful candidate for vice president on Democratic ticket with Al Gore, Jr., in 2000; unsuccessful candidate for Democratic nomination for president, 2004; was not a candidate for reelection to the Senate in 2012. Victory Park Capital Victory Park Capital is a privately held, registered investment advisor dedicated to alternative investing. No Labels They claim to give "a voice to all the people in the middle"